Sunshine on autumn crocuses (colchicum autumnale) along the path where we walk. They look a bit out of place to me with their pale colour more reminiscent of spring. How pretty they are. I just love Sunday nights with the prospect of a Monday holiday. 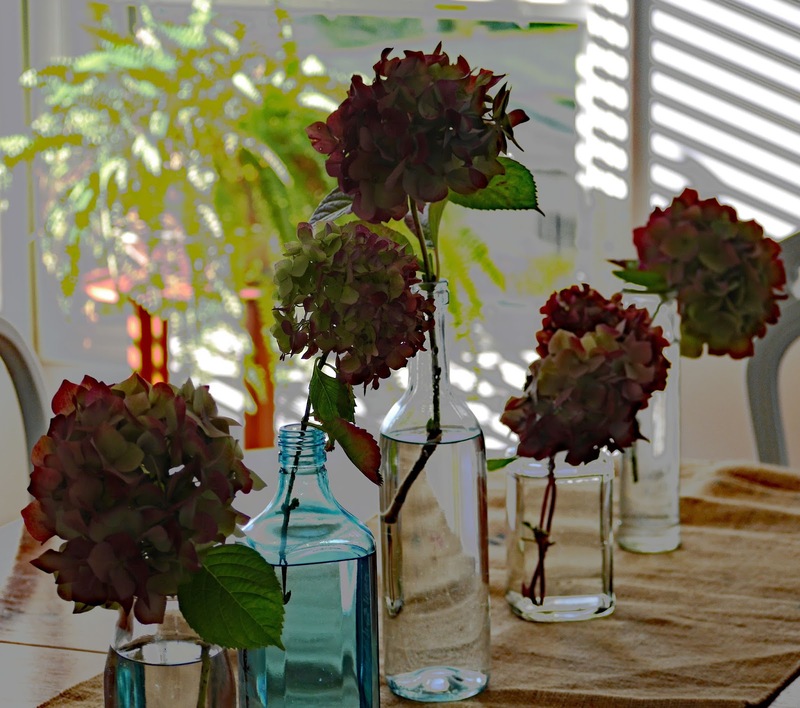 We had a beautiful weekend (after rainy Saturday), and I clipped some hydrangea stems for the dining room table, and poked them into recycled bottles of various shapes and colours. The colours are wonderful - ruddy pink, pale green, deep purple, and pale blue. Fun with photo editing - a coloured pencil sketch done with a few clicks of the mouse. The wind is rising tonight. Our weather forecast is for a few stormy days with winds coming in off the Pacific in a series of storms. October is one of my favourite months. It might be at the top of the list. I do love summer, but October has Thanksgiving, changeable weather, lovely colour, and my birthday. What's not to like? Lovely use of recycled bottles. Both my boys were born in October and they are respectively turning 21 and 18 which are big birthdays for many reasons. Our anniversary is also this month. Still hot during the day here, but weather is changing -- mornings are so much nicer now. Take care, Tammy P.S. Birthday blessings and wishes to you! 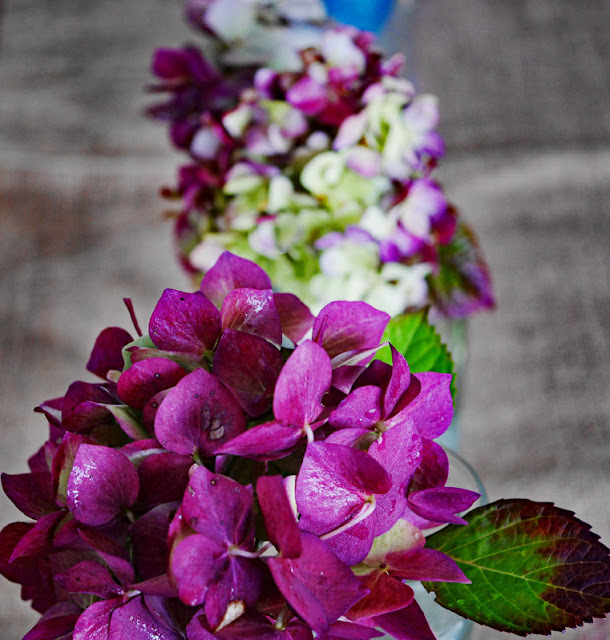 I love the way you have arranged the hydrangea, simple but effective it looks amazing. October brings the cooler months where I am quite at home sitting in front of the stove with a craft project or two so October is usually one of my most productive months. October is my favorite, too! It also happens to be my birth month and the birth month of a few people I love! But it is the colors and the temperature changes and the glorious skies, that win my heart. 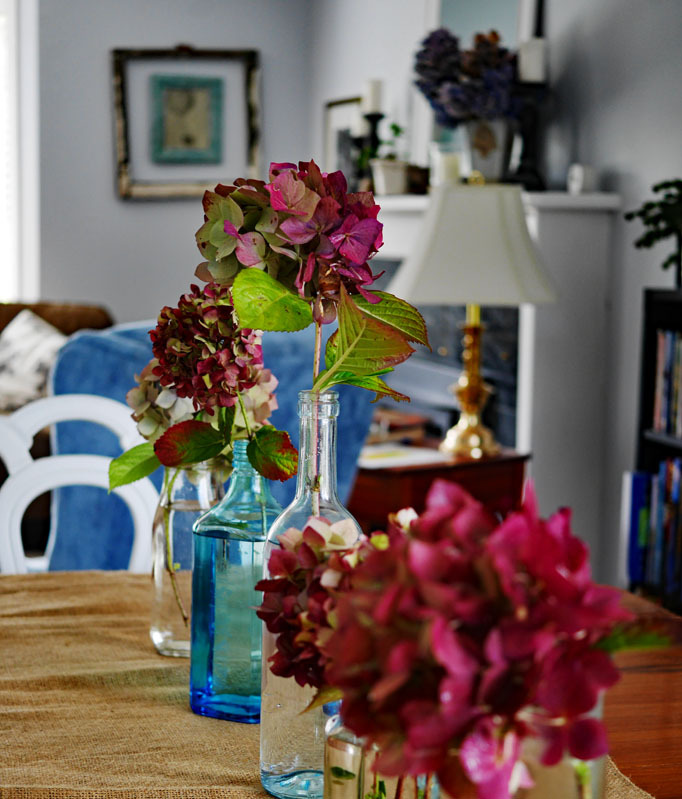 Your photos are fabulous and I especially adore those hydrangea! 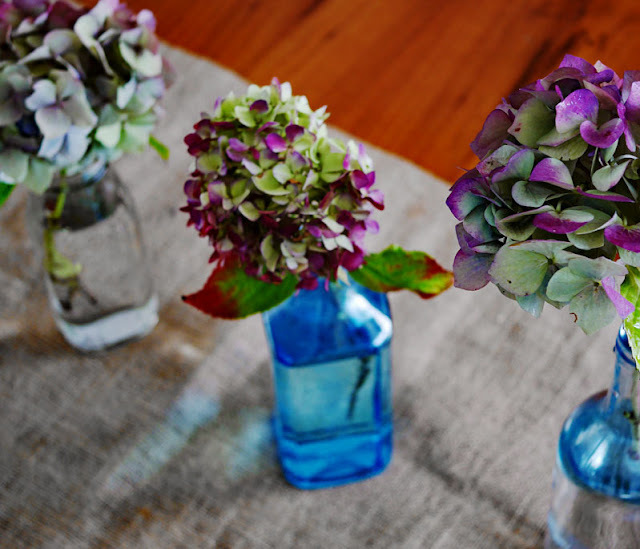 Your table looks wonderful with those pretty hydrangeas and I love the idea of using recycled bottles of different shapes and sizes. My hydrangeas have turned that lovely deep crimson colour too...from being a very pretty blue in the Summer! 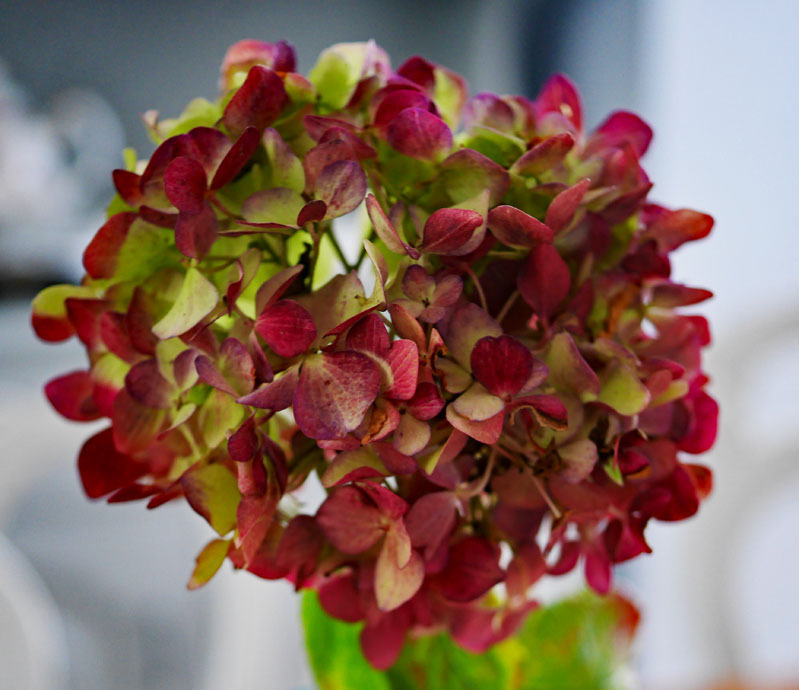 Hydrangeas are so wonderful -- beautiful in all stages! Love your arrangements. We're enjoying the beginning of that stormy weather here in Eugene and the Oregon coast is supposed to get hit with high winds. We need the rain. I like October now more than I used to. Because of our winter migration to Florida these days, Autumn is really the only seasonal change we notice. So I love the colors and just watching the changes. More fun than it used to be, because I used to get a little sad knowing what was coming next season (when we lived here full time for all those years). Dark damp rainy days sap my energy -- I can handle a few at a time, just not a whole winter's worth. We are "battening down the hatches" here too. I think you will probably get more of the storms than we will, as we are more inland, but still, we are taking precautions. Your pictures of the hydranges are lovely, and I like how you created a lovely effect by editing them too. I do so love October, and wish it could last longer, sadly all this wind and rain will probably do away with many of the leaves :( Hugs to you today, stay warm and dry! your flowers are outstanding and i love how you display them. We had high winds this morning, likely the tail end of Matthew and such devastation out east! I haven't brought any hydrangea flowers inside yet but they are a pretty sight, especially in lots of little vases. Happy Birthday month. I hope you can enjoy it all month long. Love, love the bottles with the hydrangeas. So very pretty. Your fall weather sounds a bit broody. We have had cloudy, wet days, too, but the sun came out today. I love the hydrangeas on your table. I do wish I could grow them them. They make a very elegant table. The fall is a quiet time of the year. After a busy summer we need the gentleness of fall to get ready for the holidays. You have one down. We have two to go. Enjoy your weekend. October is my favorite...even without a birthday or Thanksgiving! Oh, the color, the crisp air (after months of sultry, humid air), the coziness...indeed, what's not to love? As always, I enjoyed your photos and God's handiwork. May this October weekend be peaceful amidst the storm(s). In total agreement here...no month more lovely than October. Oh my, those ruddy hydrangeas are exquisite. Such pretty flowers! Thanksgiving and Halloween are what I like about October! October in Florida is not that exciting, but it does bring slightly cooler temps which I love. I miss the Octobers of Michigan and Wisconsin.